My Guest NCPG | Gambling Recovery Can Start Here. Sharing Hope, Awareness, and Support. The National Problem Gambling Helpline Network (1-800-522-4700), a single national access point to local resources. The annual National Conference on Problem Gambling, the world’s oldest and largest problem gambling-specific conference. 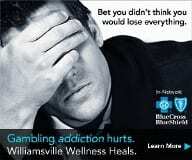 National Problem Gambling Awareness Month (annually in March). International Holiday Lottery Campaign (annually in December). Administration of the National Certified Gambling Counselor (NCGC) credential. Providing education on problem gambling issues to Federal, state, tribal and international governments and agencies. Distribution of information and literature on problem gambling treatment, research, and recovery. National referral resource on gambling counselors and treatment facilities. The organization was founded in 1972 by Msgr. Joseph A. Dunne and Dr. Robert Custer, among others. From the outset, the Council established two principles that remain in effect today: that the organization would be the advocate for problem gamblers and their families, and that it would take no position for or against legalized gambling. This stance is encompassed today in our vision and mission statements above. A history of the NCPG from 1972 to 1985 by Msgr. Dunne was published in the Journal of Gambling Studies, Vol. 1, Issue 1. To join as a member or to support NCPG with a tax-deductible contribution, click here to view our Membership Types and Benefits. Washington, DC – This March, the National Council on Problem Gambling will host the 14th annual Problem Gambling Awareness Month (PGAM) in collaboration with its affiliates, members and corporate partners across the country. Approximately 2 million U.S. adults, or 1% of the population, are estimated to meet criteria for serious gambling problems, and another 4-6 million (2-3%) would be considered to have moderate gambling problems; yet for many, gambling remains a hidden addiction. The estimated national social cost to families and communities due to bankruptcy, divorce, job loss, home loss, and criminal justice costs associated with problem gambling is $6.7 billion each year. This year’s PGAM theme, “Have the Conversation,” focuses on the importance of an open dialogue and candid discussion about problem gambling. A variety of media materials will be used throughout the month to highlight the common warning signs of problem gambling and bring attention to the resources available for those struggling with a gambling problem. NCPG’s state affiliates and members, both individual and organizational, will offer local programs specifically geared to their communities. A calendar of local activities held during Problem Gambling Awareness Month can be found at ncpgambling.org/pgamevents/. Problem Gambling Awareness Month will also feature Gambling Disorder Screening Day on March 13, 2018, in collaboration with Cambridge Health Alliance. Screening Day is an international movement designed to support healthcare providers in the identification of gambling problems. Gambling disorders lead to financial, emotional, social, occupational and physical harms, yet many cases go undetected, due to limited assessment for this problem. Screening Day addresses the imperative and provides tools to detect gambling-related problems as early as possible. “Problem Gambling Awareness Month is an important time for us to reach new audiences with critical information about prevention, education, and treatment for Problem Gambling,” said NCPG Executive Director, Keith Whyte. If you or someone you know has a gambling problem, call or text the National Problem Gambling Helpline Network at 1-800-522-4700 or visit www.ncpg.org/chat for confidential help. NCPG is the national advocate for problem gamblers and their families. NCPG is neutral on legalized gambling and works with all stakeholders to promote responsible gaming. For more information on the 32nd National Conference on Problem Gambling, visit www.ncpgambling.org/conference. How does a good girl go bad? Based on a true story, told in the author’s own words, without polish or prose, this haunting tale of addiction, family secrets, abuse, sexual misconduct, destruction, crime and…. recovery! One day at a time, one page at a time. Learn of this remarkable and brave story. “I Love Sharing Important News From My Friends At NCPG & Keith Whyte. . .
Hello Recovery Friends, Readers & New Visitors ~ Happy Blessed Holidays! I enjoy sharing loads of events and info about Problem Gambling any chance I can. So here is a share from good friends at The National Council of Problem Gambling. They are a great folks out there doing awesome work for those with gambling problems and their families. The also help Raise Awareness, Educate, and Inform the public on how problem gambling impacts our family, friends, and even our communities! They have some fun things going on and so I wanted to share my resent news letter to share and help inform my friends here about all they do! 24 Hour Confidential National Helpline 1-800-522-4700 . . .
Children are at the heart of the holidays for many people, and always a part of NCPG’s outreach efforts in problem gambling awareness. Your gift today will help ensure that NCPG’s services will be there when they need them, including the following three programs. Our Holiday Lottery Campaign works with state lotteries to raise awareness among their retailers and customers about the risks of gifting lottery products to minors. Many people are not aware that an early start in gambling activities and especially an early ‘big win’ are associated with an increased risk of gambling problems later in life. If a child or youth wants information or help on problem gambling, our National Problem Gambling Helpline (1-800-522-4700) is of course available to them. But you may have noticed, as we have, that younger people frequently prefer to communicate by text and online chat. So we are expanding our Helpline services to include text, chat, and an online forum in 2015. We want to engage our young people in the ways that they use to communicate, and that they increasingly use to gamble. Social gaming – the so-called ‘free’ games that many young people play on Facebook and elsewhere online – is an area of concern for NCPG and should be for parents and families as well. Many of these games mimic gambling but are without the same rules or protections to which regulated gambling must adhere. The games are very popular – young people commonly spend a large percentage of their time on it and even spend real money to buy virtual products that give them greater advantages within the game. That’s why NCPG created our Social Gaming Consumer Protection Guidelines – we want to reduce the risk for young people and their parents who play simulated gambling games online in social media. And of course, children whose parents have a gambling problem can’t help but be affected by it – the loss of time and attention is just as important as the loss of financial resources and all that may follow, such as loss of home, education, and opportunities. Our National Helpline is there for them in these situations as well. Young people can call with their concerns and receive professional advice and information on how and where to get help for their loved one’s gambling problem. NCPG and our 37 state Affiliates provide resources at no charge so that parents can get the help they need, and enjoy the holidays – and their children – to their heart’s content. Please help NCPG continue to help children and families by contributing to our Year-End Appeal today. It’s easy and quick to donate online – just click here! Or download a donation form and return it by mail with your check. You’ll know that you have helped bring help and hope to many people who need it. P.S. Please consider making a gift of $42 for NCPG’s 42 years of service. If you so choose, your gift and a special child or family member will be acknowledged on our Celebrate and Inspire web page. Check to see posts from our NCPG family! Distribution of information and literature on problem gambling treatment, research and recovery. National referral resource on gambling counselors and treatment facilities. . .